Note number one: My sister is leaving for Spain. On Wednesday. For four months. I am seeing her off at the airport. I will die inside a little and probably cry. 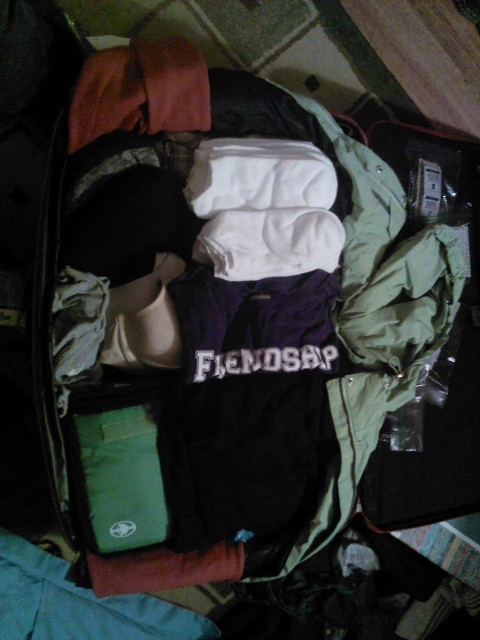 Note number two: I asked her to write a blog post for me about what she packed for a semester abroad, and here it is! Note number three: If you like making lists and you would like to send me a guest blog about what’s in your suitcase, I would love that! Email some details about your trip (destination and duration) and what made the cut for your suitcase to bornagainminimalist@gmail.com. A few months ago, I was approved for a study abroad program in Spain. A few days ago, my sister and I packed for my trip to Spain. Let me tell you, it was an interesting time. My original packing list included items that I wouldn’t really need. Three hoodies? Twenty pairs of underwear, makeup, 5 t-shirts, 15 tops, the list goes on. My host mother will be doing my laundry once a week. I don’t need such an abundance of clothes. I’m not quite as minimalist-ey as Caitlin, though, so I didn’t want to pack just one week’s worth of clothing. I ended up packing only clothing that was extremely comfortable, easy to wash, could hang-dry, and actually looked good on me. I have already decided to only take the jewelry I wear on the plane (friendship bracelets, the necklace with my sorority’s letters on it, one pair of “nicer” earrings and my plastic ear plugs), not take any make up, and to minimalize my amount of “sentimental” items (1 stuffed animal and 1 small photo album). 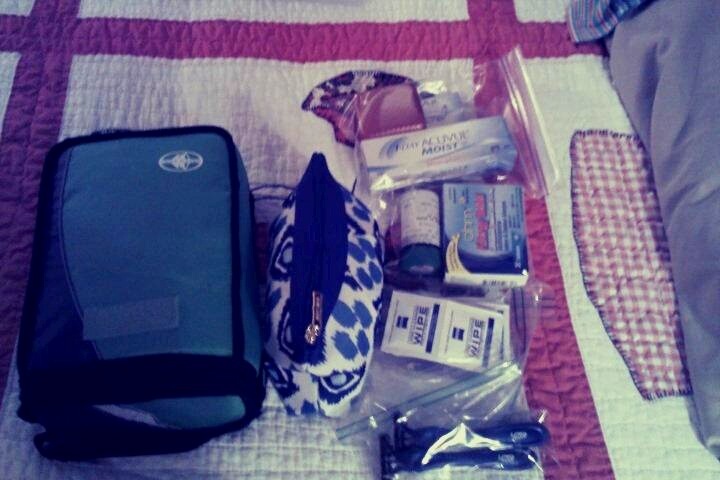 All of the toiletries fit into 3 Ziploc bags, a small cosmetics bag, and 1 small lunchbox which I will use once it isn’t full of face-cream and toothpaste. 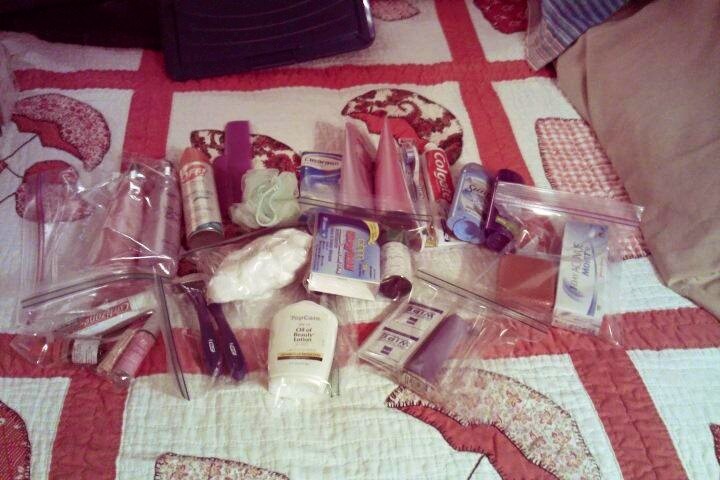 Jessica’s toiletries, all packed up nicely for compact placement in the suitcase. Though some of these items may seem a little excessive, remember that I am a student with very limited funds about to study abroad in a foreign country. I am taking over a set amount of money and I have no extra money that can be sent to me, etc. So I am packing some toiletries to last me the entire four months that I will be in Spain. The clothes all work together. That camisole can be worn under any of my tops, which can all be worn under my black cardigan. When I land in Spain it will be in the 90s (the temperature, not the decade. I’ll have running shoes in case the Doctor shows up though). I’m not taking many warm clothes, but I am taking easily-layered clothes. On a cold day I can wear my leggings under my jeans, a sweater over my shirt, and a jacket over that. The reason I am taking a small photo album is so I have something physical to hold and to share with my host family and others that I meet while abroad. Caitlin’s addendum: She’s also packing a netbook laptop computer (and charger), Kindle (and charger — a gift from me and my partner preloaded with 600+ titles so she doesn’t get bored on the planes), and two American-to-European plug adapters. Follow Jessica’s journey in Spain at http://www.sevilletoseville.wordpress.com.